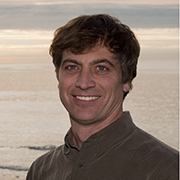 Andrew (Andy) Hamilton joined MBARI in 2002 as a Mechanical Engineer and has been the Mechanical Engineering group lead since 2009. Andrew holds an M.S. degree in Ocean Engineering and a Ph.D. in Mechanical Engineering from the University of California, Berkeley. His research interests include marine hydrodynamics, energy harvesting for oceanographic applications, buoy and mooring systems, hydrodynamics of underwater vehicles, and numerical modelling.